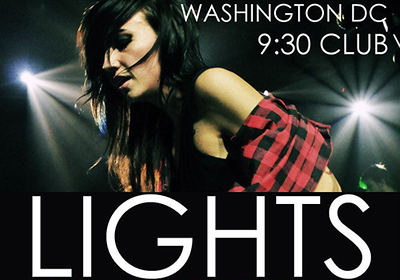 Lights, the electropop-singer/songwriter from Canada, has made her way back in the DC/metro area not once but twice in the same year and at the same venue in Washington DC at 9:30 Club. It appears that each time she returns to Washington DC, she gets bigger in terms of her supporters and fan base also known as Lights Army. She currently has over 200,000 subscribers and almost 45.5 million video views on her YouTube channel. This is an exponential increase since the last time I saw her over two years ago where she only had about 54 thousand subscribers and only 9 million upload video views back in 2009. 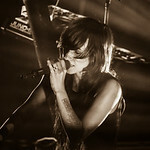 Lights started to get more exposure after winning a Juno Award in the category of "New Artist of the Year" in 2009 and nominated in a several of other awards in the next couple of years. To increase her exposure to her unique music, she began touring more than just her home country in Canada but also in the United States. Today, she has released a total of two full length albums as well as several EP. 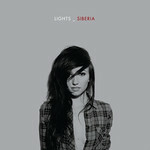 Her latest album called "Siberia" was released in the later part of 2011. 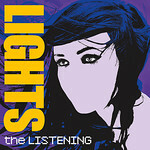 Her first album was released back in 2009 called "The Listening". After seeing Lights back in 2010 at Jammin Java, I've had the worst luck possible for not being able to make it to Lights' shows. Before this show at 9:30 Club, she has come to the DC/metro area twice. Both times I was unable to make it! I was so disappointed and so bummed. The first time I missed her show, she was performing at Sonar in Baltimore. I had work-related Halloween party that same day, so as a team player I am, I chose to go to the Halloween party over Lights. 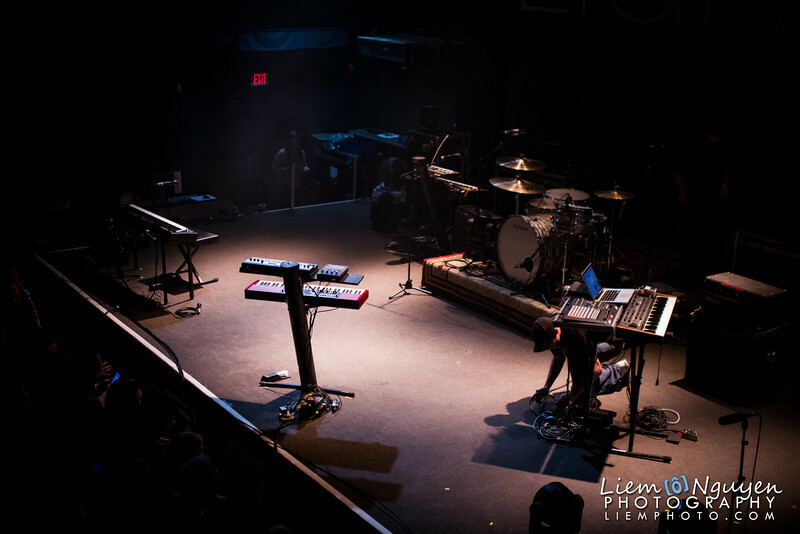 The second time was back in March of this year where she performed at 9:30 Club for the first time. Just a few days before that show, I got a sinus infection and felt so horrible. I was so sick that I had to leave early from work to go home and rest which was also the same day as the Lights show. 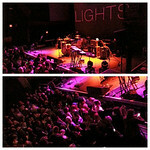 If you'd like to see or re-live Lights' show from two years ago at Jammin Java, check out my blog entry by clicking here. After many months went by this year, Lights announces she was going on another tour, and I am always hopeful she makes her way back to DC. I hear and see her announcement and she was indeed coming back to DC and back to 9:30 Club for the second time for her 2012 Fall Tour. I was hoping that third times a charm and that I wouldn't have to miss out on another Lights show. I went ahead and bought the general admissions ticket as well as parking since I don't trust taking the Metro on the weekend and don't trust parking in the streets of DC. After going to numerous shows and many different music venues, I know better than to show up at a new venue for the first time and find out last minute if taking pictures and video are allowed. If not, I would have to go back to my car and waste more time to put it away. So I made some calls to the venue and emailed Lights management to see if they have any restrictions. 9:30 Club luckily didn't have any restrictions, but unfortunately, since Lights is getting bigger, her management said video recording was forbidden but pictures were okay. I also asked Lights management if she will have a meet and greet at her show in DC, and they said she probably won't have one at that venue. That was pretty sad news to hear, but I was still very excited for Lights show because the show I saw her perform at Jammin Java was an acoustic show. 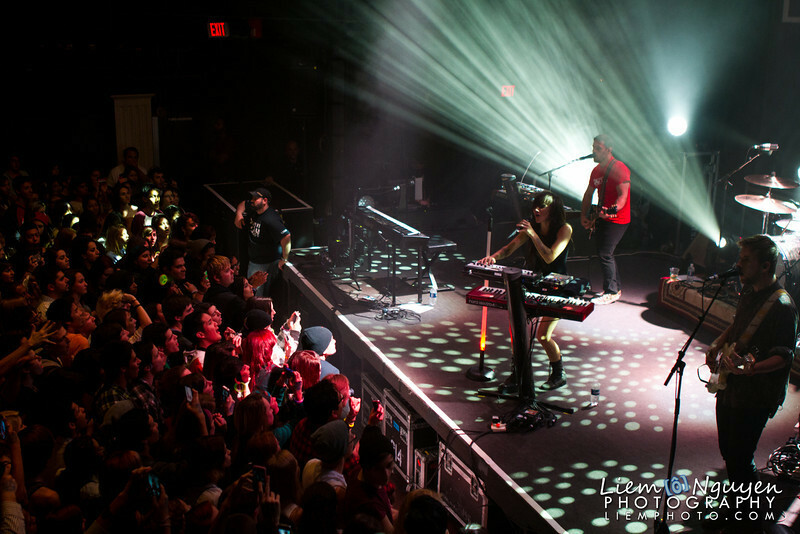 It was different from the typical Lights show because she usually jams with a full band. From what I've heard about her full band shows; it's very energetic and very fun to watch. For that, I was excited to see her perform with a full band regardless if there was no meet and greet nor video recording. On the day of the show, I found out that the show actually starts an hour later than what the ticket stated which was 8pm, so I decided to try to get to 9:30 Club an hour before doors opened which was at 7pm. I arrived at the venue around 5pm and already see there's a relatively long line. There was about four to five dozen people already in line, so I rushed to go get my car parked to avoid having the line get even longer. Once doors opened, my hopes of getting a front row standing area was crushed as it was already completely filled up. I looked around and looked up and checked out the balcony. I asked one of the people working there how to access the stairwell to get to the balcony and made my way up. Once up there, I realized that viewing wise, it was just as good as front row seats. I decided to stand on the very front right side of the balcony, which was surprisingly close to the stage. The only difficult part was that even though I was close, the lighting was darker, so it was going to be challenging to try to get nice pictures of Lights in her show. I was able to stand where the railing had a pole which was useful because I could hang my jacket on it and also use it to hang my camera off the railing to get a better shots of Lights and the whole stage with the big text of "Lights" on the backdrop from the projector. The show started around 8:15pm with the Arkells, also from Canada, opened the show for Lights. Their set ran for about half an hour. During the set Lights made a guest performance with the Arkells while they were performing a cover of "You Make My Dreams Come True" by Hall & Oates. To see the video footage, you can click on the link below. Video credit for this cover goes to Tiffaney Miskolczi. [ Performance ] You Make My Dreams Come True (cover)Lights finally hits the stage around 9:20pm. The lights goes out and her bands starts hit the music. The crowd starts roaring and cheering for Lights! 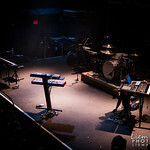 It was definitely a full house at 9:30 Club, and everyone was dancing and raving to Lights. 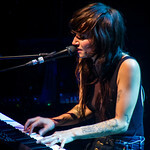 Lights performs a total of fifteen songs in her set where four of them were coming from her first album "The Listening", ten were from her latest album "Siberia", and one was a cover song by Blondie. She ended her the show with an encore performance singing to her song Banner. Her show was very exciting, and she pretty intimate with the crowd even at a medium sized venue. She was reaching out and holding hands with her fans reaching over the barricade. It was such a great show! The energy that she had on stage with a full band, stage setup, and a light up microphone stand definitely makes the stage a pretty unique one. The lighting for the show was fabulous! Lights were coming coming everywhere making it great for photographers to take great vivid pictures. 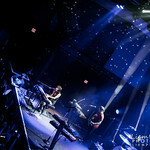 The lighting on stage at 9:30 Club was definitely like how I've seen some clips of Lights' shows on YouTube. Even though I wasn't able to video record the show because my equipment would be considered too "Professional", I had to depend on other people who posted videos on YouTube. So, for that, special thanks to, chet man and K33NA101 for posting the videos. To view the videos, click on the links below. After the show ended, I tried to stick around as long as I could to see if Lights had a change of heart and have a meet and greet. It was cold outside, so I tried to stick around the merchandise stand until they started kicking people out. I physically left the venue around 10pm and plan on standing outside next to her bus and wait for her to come out so that I could attempt to meet her for a short while. Apparently, I was not the only person to do that. I find myself in another long line just sticking around. I was outside in line for a good two hours. The whole time, Lights still didn't come out. The 9:30 Club staff said she was already in the bus and that her voice is shot, so she couldn't make it out for the meet and greet. 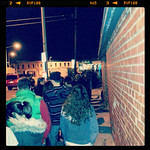 As the night got colder and and much later, the line got shorter and shorter yet still no Lights. It was expected thought as I already had an email response from her management team that she wasn't going to have a meet and greet, but I was still trying to be hopeful. I had her Siberia album and picture of me and her from last time I saw her to get signed, but I guess I'll either need to come much earlier or just hope to meet her next time. All and all, it was a great show with great energy. 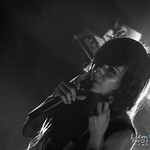 Thanks Lights for coming back to the DC/metro area and glad my third attempt to come to your show was a charm! Hope to be able to see you next time! If you're interested to know more about Lights and would like hear more music by her, please do check out her website and social network pages below. As always, go out and support her by going to her shows and buying and music.